If you choose to print from the HTML version you currently see on your screen, you may need to set your browser's printing preferences so that no margins are cropped. Purple loosestrife (Lythrum salicaria) is an aggressive, herbaceous, semiaquatic perennial that became naturalized in North America following introductions from Europe in the early 1800s. The plant's rapid spread throughout the northeastern United States and southeastern Canadian provinces by the late 1800s was most likely facilitated by the dumping of ships' ballast soil containing seed and the presence of seed in livestock bedding, forage, and wool. It was also encouraged by deliberate plantings for ornamental and medicinal purposes. As a result, purple loosestrife soon became established throughout much of temperate North America. Its invasive nature has been cause for great concern. 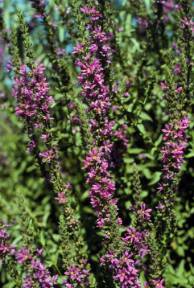 Purple loosestrife extended its range into the western United States over the last half century. Its presence has distressed wetland ecologists, conservationists, and outdoorsmen. L. salicaria thrives in wetlands, wet pastures, drainage ditches, irrigation canals, and floodplains of freshwater streams, rivers, lakes, and ponds. Over 75% of Washington counties have reported infestations. The most heavily impacted areas are located along the Frenchman Hills and Winchester Wasteways of Grant County and adjacent to the Columbia, Okanogan, Snake, and Yakima rivers. In heavily affected areas, stands of the weed dominate, displacing wildlife-supporting vegetation and offering little or no value to the ecosystem. The resulting degradation in plant species diversity can permanently displace certain birds and mammals. Infestations also impact water-based recreational activities by decreasing the storage capacities of water bodies, clogging irrigation ditches and canals, and increasing silt. In short, the presence of purple loosestrife can be both ecologically and economically undesirable. Purple loosestrife is a member of the loosestrife family (Lythraceae). The plant has a strong affinity for moist or saturated soils. It occasionally may be found in drier sites but plants are not as vigorous as those found in wetter soils. Watercourses and wetlands having shade-covered areas are less susceptible to invasion and colonization by purple loosestrife. An established plant produces multiple semi-woody, upright stems that can range in height from 1.5 to 10 feet. These stems are killed by fall frosts but they do not readily decompose. The dead stems remain attached to the root crown for several years, contributing to the impenetrability of the stands. Purple loosestrife leaves are usually 1.2 to 4 inches long. Upper leaves are smaller, are lance-shaped with heart-like bases, and lack petioles. Lower leaves are arranged in an opposite formation or in whorls of three, while upper leaves are alternate. In the fall, the leaves turn yellow, orange, red, and purple before dropping from the plant. The weed has a dense, woody root system comprised of an abbreviated taproot and lateral roots with numerous shoot buds. The roots of adjacent plants intertwine to form a dense mat that makes it difficult, if not impossible, to successfully uproot individual plants. The root mat also provides a physical barrier that discourages establishment of other plant species. Purple loosestrife is most easily identifiable during late June to early September when it is flowering. Flowering occurs in dense terminal spikes of numerous, small, rose-purple flowers from a few inches to more than three feet in length. An averaged-sized plant can produce up to three million minute seeds annually. Seeds disseminate primarily by drifting in moving water, but can also be transported long distances in mud adhering to wildlife, livestock, humans, and vehicles. The plant can also reproduce vegetatively by resprouting from cut stems and regenerating from rootstock fragments. Management options have included mowing or clipping, grazing, burning, water level manipulation, hand pulling or digging, and herbicide applications. Some of these methods work very well with small populations, but all are very costly to implement and usually require repeated application for long-term control. Additionally, some methods may be environmentally undesirable. Unquestionably, the most ecologically sensitive, cost-effective, and sustainable purple loosestrife management approach is biological control. Biological control involves the intentional release of host-specific organisms to reduce a weed's distribution and abundance. The overall goal is to reduce the density of the target plant to a level where it is no longer an ecological or economic threat to its environment. Currently, several insect natural enemies are being used to combat populations of purple loosestrife across the United States and Canada. 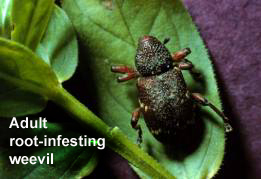 These include the bud- and foliage-feeding beetles Galerucella calmariensis and G. pusilla, the root-feeding weevil Hylobius transversovittatus, and the seed-capsule-infesting weevil Nanophyes marmoratus. Federal and state regulatory officials have sanctioned the importation and release of these organisms in the United States. Initial releases of G. calmariensis, G. pusilla, and H. transversovittatus were made in 1992 in Washington and N. marmoratus was first released in 1996. Overwintered Galerucella spp. adults appear in May and feed upon young purple loosestrife leaves. Females lay eggs in clusters of two to six on stems, leaves, and leaf axils from mid-May to mid-July. Upon hatching, groups of larvae feed upon leaf and flower bud tissue, whereas older larvae primarily consume leaves. The larvae pupate within the soil and the first generation adults emerge and appear on plants in early summer. These adults feed and lay eggs through September, after which time they seek overwintering sites amongst soil debris. Results of larval feeding include reduction of shoot growth and prevention of flower and seed formation. High densities of both the adults and larvae result in complete defoliation and plant mortality. 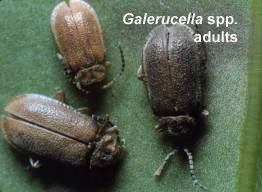 Of the biological control insects studied, Galerucella spp. have the most dramatic visible impact on purple loosestrife. In Grant County, entire stands of the weed have been decimated through the constant defoliation and associated depletion of root reserves caused by these beetles. Hylobius transversovittatus adults emerge from their overwintering sites and are evident on purple loosestrife in early May. The adults feed at night upon the margins of purple loosestrife leaves. Females start to lay eggs shortly after emergence and continue to do so through September. Each female produces approximately 300 eggs at the rate of one to three per day. The eggs are deposited into the soil near the plants' roots or directly into the stems near the soil surface. Once the eggs hatch, larvae tunnel into the roots where they feed upon the rich carbohydrates and nutrients stored within. 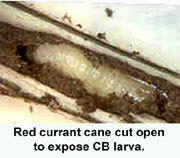 Larvae will feed within the roots for one to two years before pupating within the damaged roots. Only a single generation is completed annually. Injury to the plants includes stunted growth and fewer stems, which result in less seed. Complete destruction of the roots can occur when multiple larvae attack a plant over several consecutive years. Nanophyes marmoratus has been proven to complement both Galerucella spp. and H. transversovittatus in European studies and was thus introduced to supplement the biological control effort in North America. Adult beetles emerge in late April to early May and initially feed upon the newly unfolding tender leaves and shoots of purple loosestrife. As the plant continues to develop, the beetles move up onto the developing flower heads and begin mating and feeding upon the closed flower buds. Egg laying occurs from June through September. Females will deposit from 60 to 100 eggs singly into separate immature flower buds during this time. Upon hatching, the larvae begin consuming the undeveloped internal portions of the flower, including the ovary. Pupation takes place within the damaged buds. The buds remain closed and seldom drop prematurely. The newly formed adults chew a hole through the flower bud wall to emerge in late summer, when they feed on any remaining leaves of the purple loosestrife before seeking out their overwintering sites in the soil. This beetle completes one generation per year. High infestations of the adults can cause initial stunting of plants. European studies have shown that the larvae and adults collectively can reduce potential seed output by up to 60%. 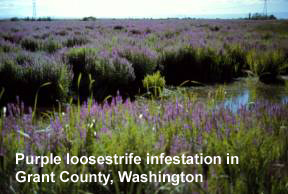 Further research will determine how effective these beetles are against purple loosestrife in Washington State. Biological control does not promise elimination of the designated target. Typically, some plants escape the control measures. However, the efficiency and endurance of a biological control program, especially when integrated with other proven management techniques, can reduce invasive weed populations to much more tolerable levels. The outlook for further suppression of purple loosestrife in Washington and other areas of the United States using biological control appears to be extraordinarily promising. Elizabeth Boyd (eboyd@gocougs.wsu.edu or 509-335-5818) and Gary Piper (glpiper@wsu.edu or 509-335-1947) are with the Department of Entomology at Washington State University in Pullman. In a recent issue of this newsletter (February 2002, "QBL Is Now a Tabloid Queen," Issue No. 190) I introduced the twelfth step in the Queen Bee of Labels' (QBL's) Get Well Program for Pesticide Labels: Registrants shall work unceasingly to reduce confusion in all areas of pesticide labels. In short, while some maintain that cleanliness is next to Godliness, in the world of pesticide labels, clarity rules. Walking around in circles clutching a pesticide container. Being unable to make a decision about anything for fear that it will be wrong. Use of one of several sprayer types to apply pure water to anything that doesn't move (known in psych-circles as Spray Fulfillment Behavior). If you or someone you know is exhibiting symptoms identified with PLCD, do not self medicate! Seek professional help at once. But take heart: treatment is available. It is expensive and it may be prolonged; however, I, the QBL, believe that certain Wayward Registrants and the EPA may be equally liable for treatment costs. You see, it has been determined that PLCD, a devastating condition, is brought on by overexposure to confusing pesticide labels. Yes, lousy labels have been the cause of the loss of many productive hours on farms, rights-of-ways, public parks, and in other work sites across America. With an outbreak of this magnitude, can PLCD in the home be far behind? This terrible waste will only be alleviated when EPA finally does the right thing and appoints me to my proper place as the QBL. Once the Royal Rules are instituted, PLCD will surely take its place among the vanquished or near-vanquished diseases of our time. Many factors contribute to label confusion. 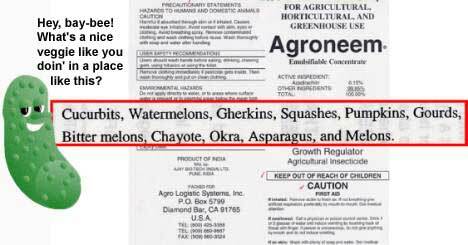 In some cases one little word or phrase can create havoc within a pesticide label. Let's examine Platte's Prometryne 4L label, a tiny but telling example of a label gone wrong. On the front of the label, just under the product name, the label carries a statement saying that the product is for use in cotton, celery, and parsley. Inside the front cover the label carries use directions for cotton and celery but none for parsley. Indeed, the only other use directions on this label are for California dill. This caused some confusion until I stumbled upon a likely explanation. Perhaps in California, dill goes by the name "the dill formerly known as parsley." After all, this is the state that taught us alfalfa sprouts were the same as lettuce when constructing a sandwich. Although this is beneath Royal Standards as far as explanations go, it is better than thinking that Platte published a label with an error on it like this and no one noticed. Next let's examine Cleary Chemical's label for its fungicide FirstStep. On the front of the label and again in the General Information section, the label states that the product is for use on ornamental and agricultural crops. 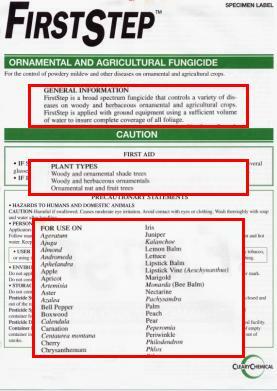 However, under the section entitled Plant Types, the label lists only ornamentals. Because some fruit trees are listed as permissable sites, we at Washington State University's Pesticide Information Center (PIC) were a bit confused. Could FirstStep be used on apple trees that produce edible fruit or not? I called Cleary and was told that this product was indeed only for use on ornamentals. This leads one to wonder what the agricultural crops are that are mentioned in a couple of places on the label. Cleary is clearly contributing to a lack of clarity (say THAT five times fast) with this label. It's only a matter of time before homeowners show signs of PLCD. A pair of labels sure to contribute to the problem are EPA #s 10772-4-4 and 70870-1-4. Both of these are Bonide-Trusted-Since-1928 products, and both are called "Remedy." Both contain 85% potassium bicarbonate. The wording on the front of the label is very similar except for one small bullet. Remedy 70870-1-4 states that it is for use on ornamental nut and fruit trees. Remedy 10772-4-4 states that it is for use on ornamental nut and (new bullet) fruit trees. The implication of this wee bullet is that the latter is for ornamental nut trees and (any old) fruit trees, leading the poor homeowner (not to mention the Poor QBL and her long-suffering staff of worker bees) to wonder if Remedy could be used on bearing fruit trees. A look inside the label doesn't shed much light on the subject because both labels carry the same usage direction wording. The tree fruits are listed under the heading Garden Applications, along with many vegetables, all of which might buttress the assumption that Remedy can be used on bearing fruit trees. While I don't know if Remedy can be used on bearing fruit trees, I do recognize a lack of clarity when I see it. I recommend that Bonide-Trusted-Since-1928 Remedy this situation soon or they will risk the Royal wRath! Another example of confusing language can be found on JR Simplot's Polar Kote 10G. This is a distributor label for a product registered by Amvac. The label carries directions for use on a category of plants that the label describes as "Ornamental Vegetable Bedding Plants (Container Grown)." The label further specifies that use is "(l)imited to only container grown plants such as: Broccoli, Brussels Sprouts, Cabbage, Cauliflower, Peppers, Tomatoes." When I took a scientific poll (i.e., asked around the office) as to what exactly this might mean, I garnered the following responses: "What is your problem?" "Aren't you familiar with ornamental vegetables?" and "You know : KALE." Well, I do know ornamental kale; in fact, I detest it. Because of this, I am somewhat sensitive to its every occurrence and I noticed right away that there was no mention of these cruciferous carbuncles on the Polar Kote 10G label. Now I have seen ornamental peppers, but...ornamental Brussels sprouts? Unable to let sleeping vegetables lie, I called the registrant of Polar Kote 10G and was immediately referred to Amvac. After a certain amount of discussion, I was told that "Ornamental Vegetable Bedding Plants (Container Grown)" referred to vegetable plants grown in small containers and marketed to places like Home Depot. QBL (in a haughty royal tone): You mean vegetables that people take home and plant in their gardens and eat? QBL (haughtier still): So, there's really nothing ornamental about this, is there? At the conclusion of this enlightening exchange, Amvac said they had "made a note" of my concern and would place the resultant note in the file for the next time that the label was up for revision. The QBL will just warm the Royal Throne and see. Don't you wonder what EPA thought ornamental Brussels sprouts were when they reviewed the label? Do you suppose that lots of EPAers grow ornamental Brussels sprouts (a cult following perhaps) and that the rest of us are just a little behind the times? 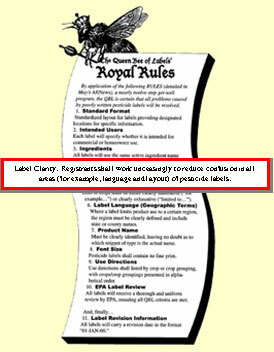 And while we're on the topic (the mere thought of ornamental kale really has the Royal Blood boiling), which do you suppose the compliance people would take more seriously: what the label actually says or what the registrant says that the label is supposed to say? While many factors contribute to a lack of label clarity, let us turn our attention toward layout. We (the Royal "We") touched on this subject back in December 2000 with "The QBL Gets Graphic" (AENews Issue No. 176), but nothing is quite so satisfying as continuing a Royal Rant. My first example for this round is Griffin's Atrapa 5E. Inside the label, under Use Directions, you will find the heading: GRAIN CROPS. The listed use sites start out just fine with barley, corn, and wheat. However, as you move down the list you come to garlic, mushroom, okra, rutabaga, avocado.... 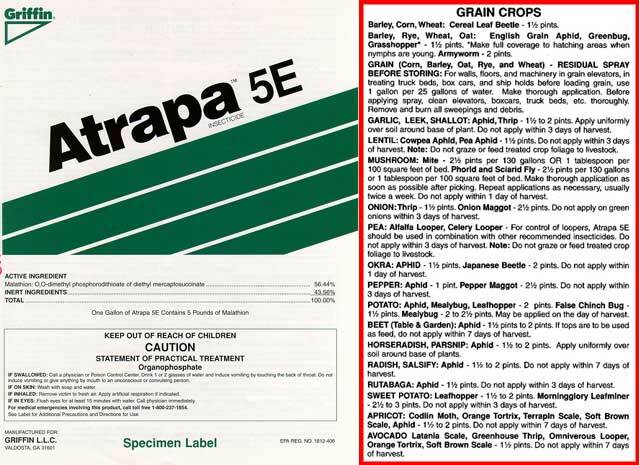 I wondered when I saw this listing if Atrapa 5E could only be used on rutabagas if they were harvested, dried, then ground up to use as grain. Not to belabor the point but what was EPA thinking when they reviewed and approved this label? If EPA didn't actually receive this label for review, then what is wrong with the review process? And (so as to not show any favoritism) what was Griffin doing when it should have been reviewing the draft label prior to printing it for final distribution? It goes back to my hypothesis that no one (except, we hope, the end users) is looking at these labels. I was also caught off-guard by Agro Logistic Systems' Agroneem label. I had been told by Charlee Parker, the tireless coordinator of the Pesticide Information Center On-Line (PICOL) Label Database (http://picol.cahe.wsu.edu) that asparagus use had been added to this label. I had decided to return the label to her with a note because I simply could not find asparagus on the label. (I thought fleetingly that "it" had finally happened: Charlee had read too many labels and gone around the bend.) I eventually spied asparagus. It was grouped, along with okra, in with the cucurbits. Imagine the indignity when these two upstanding, refined vegetables found themselves amongst a coterie of coarse cucurbits; the poor dears. I would like to close this missive with a last example of lousy layout: FMC's Brigade WSB. FMC has recently added caneberry use directions to this label--good news for those of us fond of berries. Prior to this addition, the label had ended with directions for use on strawberries. The final information in the right-hand column was headed CALIFORNIA SUPPLEMENTAL LABEL, a section providing "California-specific requirements for strawberry harvesters." Now when FMC added the caneberry use directions to the Brigade WSB label (a change that took place in September 2001, lest anyone think that the problems with this label are ancient history), they simply added the block of caneberry information to the end of the label. As you can see, it appears that the caneberry use directions fall under the California Supplemental Label heading. This is particularly PLCD-inducing because the caneberry use directions includes a "not for use in California" note. This was, in fact, the very thing that tipped off the sharp PIC staff that the header California Supplemental Label had nothing to do with caneberries. I ask you, how hard would it have been for FMC to have inserted the caneberry use directions in between Hops and Strawberries rather than lazily sticking it at the end of the label. Please note in this example the placement, size, and boldness of the offending header. All three lead the trusting label reader to believe that everything that falls after the header is information connected with the header. Registrants take note: headers are an invaluable tool in helping to organize and clarify information but their misuse and abuse will henceforth be cause for immediate inclusion onto the QBL's Wildly Wayward Registrants list. EPA, I am pleading with you, please appoint me to be the Queen Bee so that I can correct some of these problems and avert others. While it is too late for those who have already succumbed, millions of potential PLCD sufferers could be spared. Jane M. Thomas, a.k.a. Her Royal Highness the Queen Bee of Labels, presides over the Pesticide Notification Network at Washington State University's Pesticide Information Center. She can be reached at (509) 372-7493 or jmthomas@tricity.wsu.edu. What is CB? How is It Controlled? 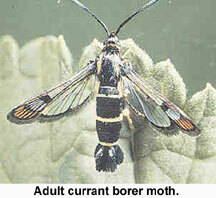 The currant borer (CB) is an attractive, day-flying clearwing moth. Its larvae (less attractive than the adult by any standard) bore inside currant canes, causing progressive dieback and serious economic damage. Washington red currant growers have historically applied multiple sprays of synthetic pyrethroid insecticides to control adult CBs, but control was difficult and often resulted in secondary outbreaks of spider mites. Use of mating disruption, also known as mating confusion, presents a softer alternative means of control. Instead of killing existing moths or their larvae, the principle behind this method is to prevent the pest from reproducing. By saturating the atmosphere around a crop with specific pheromones for the target pest, growers confuse the male moths. Ideally, the moths are disoriented to the point where they cannot find mates, leaving the females to die without producing offspring. In summer 2000 we conducted a successful small-scale mating disruption trial in a Prosser red currant field. In 2001, with funding from the Northwest Center for Small Fruit Research, we conducted a much larger trial that incorporated the entire acreage of commercial Washington red currant production. Although red currants are a high value crop, they occupy only 78 acres in the state of Washington, all of which are contained in six fields in the Prosser area. 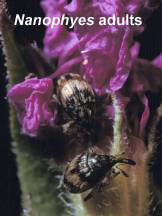 In May 2001 we obtained CB pheromone dispensers from the Shin-Etsu company of Japan through their Pacific Northwest distributor, Pacific Biocontrol Corporation. We tied these to red currant plants and posts at a density of 200 to 275 dispensers per acre on 72 of the 78 acres. On the remaining six acres we used another type of dispenser, a high-release, low-point-source lure from ChemTica Internacional (Costa Rica). These high-rate dispensers were deployed at a rate of 24 per acre. Measure #1: Counting Males. To monitor the impact of the pheromone dispensers on mating activity, we placed pheromone-based monitoring traps in the fields at a density of about three per ten acres. If successful mating disruption is taking place, male moths should find it difficult to locate monitoring traps, resulting in a low count. Measure #2: Counting Larvae. At the end of the season, we measured the incidence of larvae in canes. These counts were taken after the flight period of the adult moths, during winter 2001/2002. Results from weekly monitoring of adult CB flight activity in the fields during 2001 were dramatic when compared to 2000 when insecticides were used (Figure 1). In Field A, an average of one CB was trapped per week May through August 2001, compared to 88 CB per week in 2000. All fields had similar low numbers of CB trapped, indicating males found it difficult to locate females. Numbers of larvae found in winter canes were very low (0-0.16 larvae per cane) in four of the six fields, indicating pheromones successfully prevented CB mating and egg laying. However, in two fields, larvae were common at densities of 0.76 and 0.48 per cane. In both fields additional sampling of perimeter canes revealed an even higher incidence of larvae (~1.00 per cane). These fields were characterized by having had very high population levels of CB in 2000, compared to the other four fields. Thus, it is likely that while mating was not common within the fields (as indicated by low trap numbers), significant numbers of CB found each other outside the fields and mated. Females then returned to the fields to lay their eggs. This scenario would be consistent with the greater incidence of larvae in perimeter rows. Weekly abundance of adult currant borers trapped in a Prosser red currant field using insecticides (2000) or pheromones (2001) for control. The problems of excessively large populations of CB and of mating outside the pheromone-treated area will be addressed in our 2002 field trial program. We will increase the rate of pheromone dispenser deployment in the two problem fields and use a well-timed early season insecticide application to help bring down CB populations to a level manageable with pheromones alone. In addition we will extend the zone of pheromone activity around the fields by placing dispensers outside the fields boundaries. It is expected that the combination of these strategies will reduce larval infestation in winter canes to the low levels seen in the other four fields. 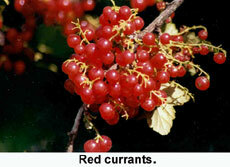 As I indicated in 2000, the prospects are very good for managing CB in red currants using mating disruption. This potential clearly extends beyond the Prosser acreage and beyond the bounds of Washington State. 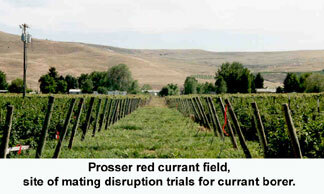 In 2001, we directed and assisted with concurrent mating disruption trials in currants in British Columbia and Oregon. Mating disruption may prove effective throughout the Northwest on this high-value crop. Dr. David James is an Entomologist with Washington State University's Irrigated Agriculture Research and Extension Center (IAREC) in Prosser. He can be reached at djames@tricity.wsu.edu or (509) 786-9280. "Turf clippings and other plant materials including agricultural plant materials are often recycled to composting facilities. There is evidence that finished compost that has incorporated turf clippings treated with clopyralid as a feedstock may contain residues harmful to sensitive plant species. The clopyralid residues on turf clippings and other plant materials are not breaking down as rapidly as anticipated during the composting process." Further background documents are posted on the Pesticide Notification Network (PNN) Web page at http://www.pnn.wsu.edu . Comments on the proposed rules are due to WSDA by 4/24/02. WSDA intends to adopt these rules 5/13/02. Note that because of the lack of degradation information available to WSDA, as the regulations are currently worded, once clopyralid has been applied to golf courses or other nonresidential turf, clippings from these areas may never be composted. for PDF of informational postcard. Detailed conference brochures will mail later this month. Contact Ann Brelsford at (509) 335-2811 or ceeps@wsu.edu for more information or to be put on the brochure mailing list. The Pacific Northwest Agricultural Safety and Health (PNASH) Center, along with the University of California at Davis Agricultural Center, is pleased to offer a unique conference developed for individuals involved in agricultural safety and health research along the west coast. The conference is designed for academic investigators, students, federal and state agency researchers, research administrators and staff, and farmworker clinicians. A goal of this conference is to develop real collaborative projects. Therefore, along with information sessions, there are discussion sessions dedicated to exploring new areas for collaboration between organizations in the West. Each session will be lead by a panel that will present their ideas to conference participants for discussion. Panels will be initiated prior to the conference and also be given dedicated time during the conference for discussion and assistance in presentation development. If you would like to join one of these panels, please contact Marcy Harrington at marcyw@u.washington.edu. The conference will be held at the beautiful Coeur d'Alene Resort in Coeur d'Alene, Idaho. The resort is known for its golf course and prime location on the lake. As a special treat for our conference participants, there will be a dinner cruise on Lake Coeur d'Alene. Coeur d'Alene is convenient to the Spokane International Airport and the resort offers an excellent airport transfer service. For more information, see the PNASH Web site at http://depts.washington.edu/pnash/. The Third Annual Conference on Pesticide Stewardship, to be held from August 25 to 28, 2002, offers an opportunity to participate in one of North Americas most dynamic forums on pesticide stewardship. Sponsored by the National Pesticide Stewardship Alliance (NPSA), this event brings together a diverse range of public and private sector organizations to discuss todays most pressing stewardship topics. The conference is meant to inform, challenge, and resolve. Great emphasis is placed on interactive sessions where participants, both presenters and attendees, can sit down and talk through topics of common concern. Organizations with members attending NPSA conferences include Ag Container Recycling Council (ACRC), Environmental Protection Agency (EPA), CropLife America (formerly American Crop Protection Association), American Association of Pesticide Safety Educators (AAPSE), Ag Retailers Association (ARA), and National Pest Management Association (NPMA). In addition, state pesticide collection programs and their hazardous waste contractors along with state container recycling programs use NPSA as their principal networking and conference site. This years conference will be held, for the first time, in the Pacific Northwest. Conference headquarters will be the beautiful and convenient Renaissance Madison Hotel (part of the Marriott Hotel chain), located near the Seattle waterfront. Trolley and monorail systems are available nearby to take visitors to local attractions. The Seattle area in late summer is one of North Americas most ideal vacation destinations. Salmon are running, the skies are clear, temperatures are warm, and numerous attractions, (e.g., Worlds Fair Space Needle, Museum of Flight, harbor tours, Pike Place Market, Pioneer Square) are immediately available. We urge anyone considering a wonderful vacation location to consider this opportunity. To see the many scenic, recreational, cultural, and historical opportunities in the Seattle area, visit these Web sites: http://www.tourism.wa.gov and http://www.seeseattle.org. Those interested in presenting a technical paper or arranging for a technical session must submit a 100-word abstract before April 12, 2002. Label language adjustments to improve stewardship: what else is left to do? Rinsate and sludge management options for dealer sites. Aquatic pesticide application stewardship needs and directions. 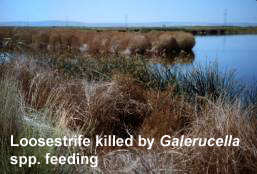 Endangered species issues: implications on pesticide Best Management Practices. Alternative funding options for ag pesticide collection programs. International stewardship partnerships: models and options for the future. Case studies of stewardship promotions that work at the dealer/retailer level. Clopyralid and composting: directions and solutions to move us forward. Improving the stewardship message (communication): what works and what doesnt? Ensuring pesticide security at manufacturer, distributor, retailer, and end-user facilities. Tactics for improving container recycling and pesticide collection in metro areas. Improving the economics of ag plastics recycling: plastic lumber opportunities and partnerships. Reducing liabilities associated with pesticide disposal and container handling. for abstract submission form, DUE APRIL 12, 2002. Late August is the PRIME TOURIST SEASON in Seattle; reserve early to assure conference lodging. NPSA has worked with the Renaissance Madison to hold a block of lower cost government and non-government rooms. To reserve your room, contact the Madison at 800-278-4159. NPSA is fully aware of the difficult economic times facing all organizations. We want you to attend this special Seattle conference, so we have prepared a special set of money-saving opportunities and reminders for you to consider. Please check them out at http://www.npsalliance.org. You will be surprised at how economical Seattle can be with the right planning! Any conference needs some attractive features to add extra excitement and interest. Here is what is being planned for Seattle: a Grand Reception Puget Sound recreational cruise; a tour for spouses; a Welcome Reception with an information exchange; pre-conference, half-day training sessions; an on-the-road session featuring salmon migration and endangered species; and a professional tour of nearby agricultural facilities and crop lands. If you missed the January 16-18, 2002 Northwest Direct Seed Cropping Systems Conference at the Doubletree Hotel  City Center in Spokane, Washington, you missed a great program attended by 900 growers and ag support personnel. But now you can have the next best thing to being there: the detailed 177-page conference proceedings. The proceedings are also being added to the conference Web site. Two groups organized the conference as a service to Northwest growers: 1) the Pacific Northwest STEEP program and 2) the PNW Direct Seed Association. STEEP (Solutions To Environmental and Economic Problems) is a cooperative research and educational program on conservation tillage systems through the University of Idaho, Oregon State University, Washington State University, and USDA-Agricultural Research Service. The grower-driven PNW Direct Seed Association (PNDSA) began in 2000 and already has a membership of over 350. PNDSA is working to facilitate the development and adoption of direct seed cropping systems through research coordination, funding and information exchange. The conference was co-sponsored by twelve agriculture support companies and was developed and promoted in cooperation with twelve Pacific Northwest grower organizations, conservation district associations, and other groups and agencies. grower experiences across the low, intermediate and high precipitation zones. A poster exhibition featured thirty-three research and educational projects. Plans are beginning for the 2003 conference. Those interested in having input as to topics and other issues about the conference are invited to send comments to Roger Veseth, Conference Coordinator, P.S.E.S. Dept., University of Idaho, Moscow, ID 83844-2339, Phone 208-885-6386, Fax 208-995-7760, E-mail rveseth@uidaho.edu . The Washington Pest Consultants Association (WaPCA) has been involved in recycling plastic pesticide containers since the early 1990s in Washington State. In 1993, WaPCA acquired a plastic granulator machine through a grant from the Washington State Department of Ecology. The trailer that transports the granulator was purchased through donations from the agrichemical industry. Northwest Ag Plastics, Inc. is contracted to operate the recycling program. Service has expanded by collecting or granulating containers at-your-site to better accommodate those who wanted to recycle. In addition, the schedule of public collections has been expanded for those who can bring their containers to a central location. THERE IS NO FEE FOR THIS SERVICE. Let NW Ag Plastics and WaPCA help you dispose of the containers so you don't have worry about regulatory activities and/or fees associated with landfills. For more information or to become active in the program, contact Clarke Brown at 509-965-6809 OR Dave Brown, (Field Representative) at 509-961-8524 OR the Northwest Ag Plastics, Inc. office at 509-457-3850. The Pesticide Notification Network (PNN) is operated by WSU's Pesticide Information Center for the Washington State Commission on Pesticide Registration. The system is designed to distribute pesticide registration and label change information to groups representing Washington's pesticide users. PNN notifications are now available on th PNN Web page. To review those sent out two months prior to this issue's date, either access the PNN page via the Pesticide Information Center On-Line (PICOL) Main Page on URL http://picol.cahe.wsu.edu/ or directly via URL http://www.pnn.wsu.edu. If you have any comments about the PNN, contact coordinator Jane Thomas at jmthomas@tricity.wsu.edu. The third International Colloquium on Invertebrate Pathology and Microbial Control (ICIPMC) will join forces with the thirty-fifth annual meeting of the Society for Invertebrate Pathology (SIP) and the sixth International Conference on Bacillus thuringiensis (ICBt) this August in Foz do Iguassu, Brazil. Plenary sessions, symposia, and oral contributed sessions will be held throughout the conference. Workshops on specific topics of interest to a variety of sub-groups will be held on Friday morning. Poster sessions are scheduled Monday through Thursday. Divisional meetings are scheduled for Monday and Tuesday evening. Student paper and poster competitions will be held, with awards provided by the SIP. The SIP business meeting is planned for Thursday afternoon. The meeting concludes on Friday. The deadline for receipt of abstracts for contributed papers and posters, as well as for complete papers for plenary lectures, symposia, and workshops is April 15, 2002. The official language for presentations is English. April 30 is the deadline for early registration. In response to a 1998 request by the US Department of Agriculture's Office of Pest Management Policy (USDA/OPMP), each state is producing documents called "Commodity and Pest Management Profiles," or "crop profiles" for short. A list of crop profiles by state is available through a national Web site maintained by North Carolina State University. Washington State's crop profiles are also available in an easy-to-read, printable PDF format. Click on any of these buttons to see the corresponding profile. Open Forum: In an attempt to promote free and open discussion of issues, The Agrichemical and Environmental News encourages letters and articles with differing views. To discuss submission of an article, please contact Dr. Allan Felsot at (509) 372-7365 or afelsot@tricity.wsu.edu; Dr. Catherine Daniels at (509) 372-7495 or cdaniels@tricity.wsu.edu; Dr. Doug Walsh at (509) 786-2226 or dwalsh@tricity.wsu.edu; Dr. Vincent Hebert at (509) 372-7393 or vhebert@tricity.wsu.edu; or AENews editor Sally O'Neal Coates at (509) 372-7378 or scoates@tricity.wsu.edu. EDITORIAL POLICY, GUIDELINES FOR SUBMISSION.